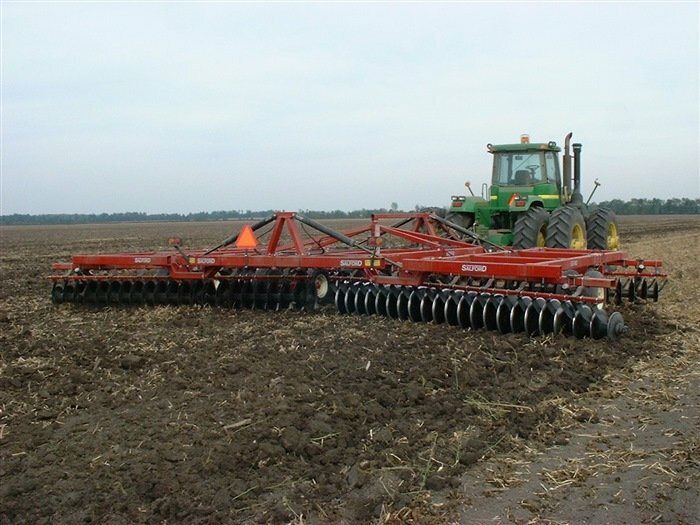 Salford's Heavy Duty Tandem Disc Harrow stands out in the industry with many unique features. With an average weight of over 600lbs/ft Salford discs have no problem with ground penetration. And the integral frame hinge allows for 3 gang angle adjustments giving you the option of using the 870 as a primary tillage disc, a finishing disc or a VT disc. Hydraulic self leveling systems and no rock shaft reduce the number of wear points for longer life and reduced maintenance costs. The rear frame of the 870 is straight allowing you to mount a variety of finishing harrows without buying a sub-frame or costly mounting hardware. The wing frame is hinged to the main frame - not the gangs - making the wing attachment much stronger than competing designs. Capable of operating in many soil types and operations, the 870 disc harrow offers unmatched versatility.